This is an informal, friendly, fun opportunity to practice performing! Piano accompaniment will be provided by Gemma Lee (for NZDRS members only). If you would like to play with Gemma, please contact her at gemmaleepiano@gmail.com to arrange getting her the music. Non members are welcome to play an unaccompanied piece. Entry for members is FREE, non-members $10. Email nzdoublereeds@gmail.com to sign up by Wednesday 28 August if you would like piano accompaniment or by Sunday 1 September if unaccompanied. 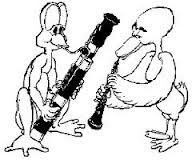 NZDRS is a branch of the Australasian Double Reed Society, a non-profit organisation which promotes and enhances knowledge of double reed instruments (oboe and bassoon family).